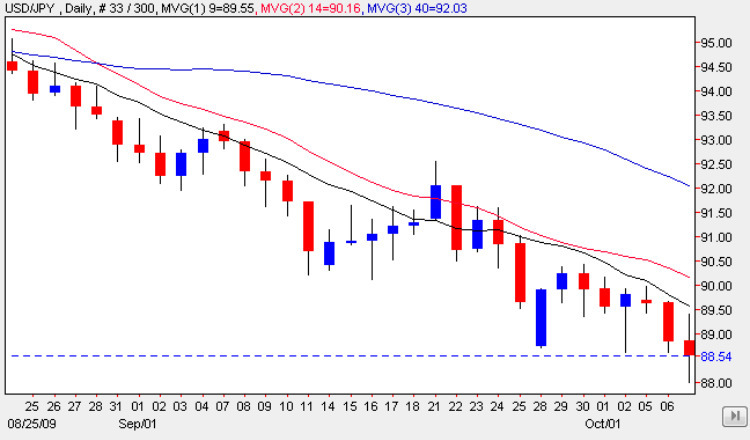 An extremely interesting day for the yen to dollar pair yesterday as the US dollar and Japanese yen slugged it out in the markets, finally closing the session exhausted and ending as a score draw, or to put it another way, a long legged doji which clearly signals a battle which no one has won! However, on a more serious note, the doji candle suggests two things – first that we may see a reversal higher in due course and possibly within the next day or so, and secondly that this could be the signal that the Bank of Japan is starting to interevene in the currency markets to prevent the Japanese Yen strengthening any further against the US dollar. Many currency analysts suggested that this was likely once the yen to dollar pair touched the 85 price level, but yesterday’s price action suggests that this may have occurred earlier than expected – either way, we should see a bounce in the pair in due course as the markets react both to the intervention and also technically to the reversal signal. The only items of fundamental news on the economic calendar for Japan were this morning’s release of the Preliminary Machine Tool Orders which came in at -61.9% and the Economy Watchers Sentiment which came in better than expected at 43.1. I have covered all the fundamental news for the US on my euro vs dollar site where the most important item will be the unemployment claims.